Captures the eye, increases sales: That is Digital Signage with odWeb.tv. Design your own advertising and information channel for your business – online, simple, with just a few mouse clicks. With odWeb.tv you present your products, your services and lots more via the screen – modern, appealing, and always up to date. Whether in salesrooms, practices, shop windows, entrance areas or waiting rooms: odWeb.tv offers space for everything that convinces the customers – at any chosen location. And with its wide range of templates and the contents of our content partner it is very easy to turn your advertising and information channel into a real eye-catcher. Discover for yourself: With odWeb.TV, Digital Signage couldn’t be easier. It only takes a few simple steps! 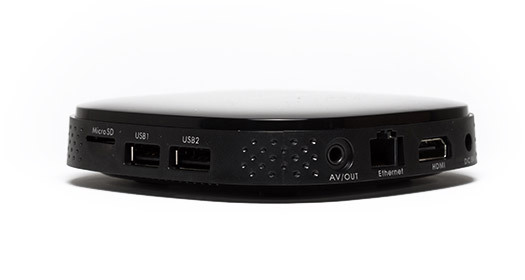 With the odWeb.tv player you can start immediately: connect your player to the internet and television, log on to www.odWeb.tv, register – and start! In our online configurator you have the choice: design your own slides with just a few clicks or select from a wide range of templates and pre-designed contents. Put together your presentation conveniently by drag & drop, and determine by mouse click, which presentations will be available for viewing where and when. And now the stage is yours: Just start your presentation and experience how odWeb.tv convinces your customers, too! Do you want to design your own slides - complete with texts, pictures and videos? Or do you want to use one of our many templates with fixed contents? Our online configurator gives you complete freedom. Our content partner dpa, sky sports news and the news programme Tagesschau* provide you continuously with the latest news for your presentation. Another eye-catcher: live weather slides for your city! On request you will receive a suitable Digital Signage Panel – for enhanced image quality, more brilliance, and extra long running times. Delivery is managed by our partner EURONICS. Access our odWeb.tv slide pool with its wide range of slides, images and templates, which you can adjust to your own ideas and use for your presentation. You will find something for every topic! With odWeb.tv, an individual advertisement and information programme adapted to the needs of an individual branch or sales area can be assigned to each monitor. With the odWeb.tv time control tool you can decide with minute-by-minute precision which content will be displayed when – for example seasonal offers. You have a question? You need advice?